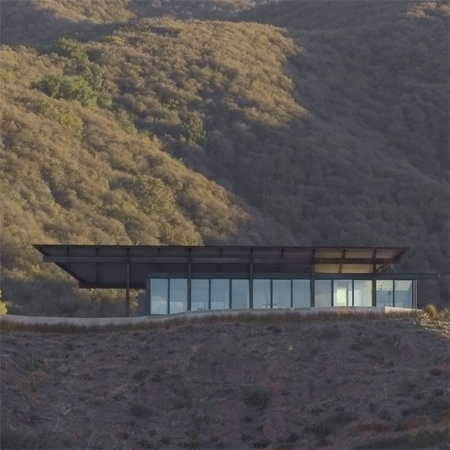 Here is a second project by Seattle architects Olson Sundberg Kundig Allen: Montecito Residence is a family house in Toro Canyon at Montecito, California. The house, like the architects' Rolling Huts project we featured yesterday, won at the AIA Seattle Honor Awards earlier this month. Montecito Residence is a single-family home set in the fire-prone Toro Canyon. The owners wanted a house that minimized its use of scarce natural resources and recognized the challenging environmental conditions of the area. The design solution is a house that functions as an umbrella to shield the house from the sun and allows naturally cool offshore breezes to move through the space. The roof harvests rainfall – directing it to a cistern which can be used for irrigation or in case of fire. The house is made of simple, fire resistant materials. Steel will be allowed to oxidize and concrete will be toned to allow the house to blend into the landscape. Tom Kundig was the lead architect for Montecito Residence. Elizabeth Bianchi Conklin was the project manager, and Huyen Hoang was staff architect.